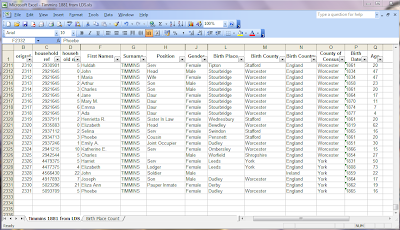 In my last post on the TIMMINS surname I was left with an action to check if I could glean more information on birth locations from the FamilySearch web site, namely the 1881 census of England and Wales. 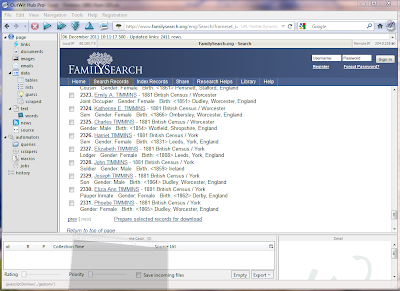 There are two possibilities for FamilySearch, either I use the old site which displays 200 entries at a time and gives a total hit of 2331 entries of the surname, or I use the new site which gives 2337 hits but only displays 20 entries at a time!I decided to use the old site as it prevented RSI by requiring fewer mouse actions. The following two images show the data as presented firstly by FamilySearch into the Outwit Hub add-on for Firefox (this is prior to using the extraction options); and, secondly the extracted data, exported in Excel format, then manipulated in an Excel spreadsheet. The search was TIMMINS with exact match ticked. One thing you will immediately notice is that Outwit Hub has extracted data that is not visible on screen! Cool! Before I move on to analyse the results let’s just see how I extracted the data. The following screen image is OH (Outwit Hub) before the export. In OH I have moved to Tables under the Data option in the left hand panel. I have filtered by Select Row if Col3 Contains timmins. I have unticked the Clean Text option as we want all the data. On Page Load I have selected Catch Selection and unticked Empty. Columns 2 and 3 contain all the data that is in the final Excel spreadsheet. Next move back to the web page by selecting Page in the left hand panel. Go to the bottom of each page and select Next until you reach the bottom of the data, 2331 in this case. OH will catch all the data. Go back to the Tables page and select Export Excel in the On Page Load panel at the far right. You can load the exported file into Excel and manipulate it as you see fit. Before you start catching data it is a good idea to play around with Outwit Hub to see if more data is available by selecting the other options in the left hand panel. Look at the source option and check through the page using find input field, just type in what you are looking for e.g. Timmins – this shows no results. I tried this on a FMP page and there was additional information that did not show on screen. There are lots of on-line tutorials by the makers and users, to get the most out of the program I would recommend you give them a go. 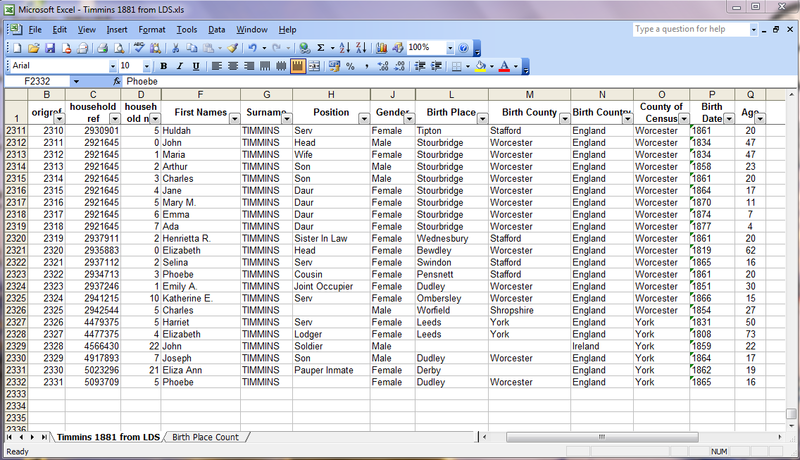 Having all the data in an Excel spreadsheet has enabled statistics heaven!! But it has also highlighted lots of errors in my original investigation using Find My Past, which goes to show that you can’t beat working with the original secondary source material, but even the LDS transcript has its anomolies. For instance West Bromwich has been spelt 10 different ways? The transcribers have been true to the original text but this does not help when you want to filter in or out certain data. I noted that non of the commercial sites I tried appeared to have suitable filtering available to enable the results I wanted! The statistics overall, albight more accurate that my first pass on FMP, still tell the same story. Here is my data relating to the parishes within the Poor Law Union boundaries. It is interesting to note that there were 83 entries without a precise birth place location; 74 of these at least gave a county or country; only 9 entries had no location whatsoever. – It is a shame that you can no longer download GEDCOM data from the old FamilySearch site. 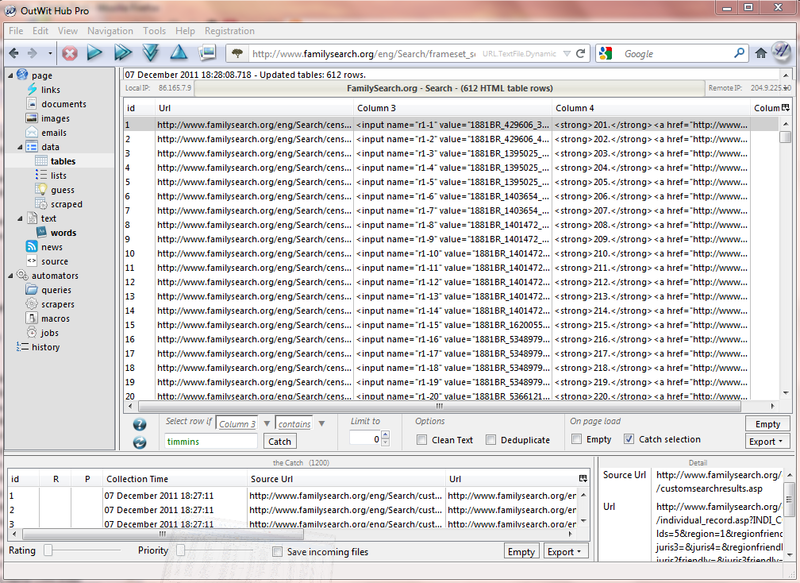 – Why does the new FamilySearch not have a download facility? – New FamilySearch needs to have 25, 50, 100, 200 items per page options (a bit like eBay). – We need to keep the old FamilySearch 1881 Census live as it has many advantages; could they provide a new front end that enables more complex searches. 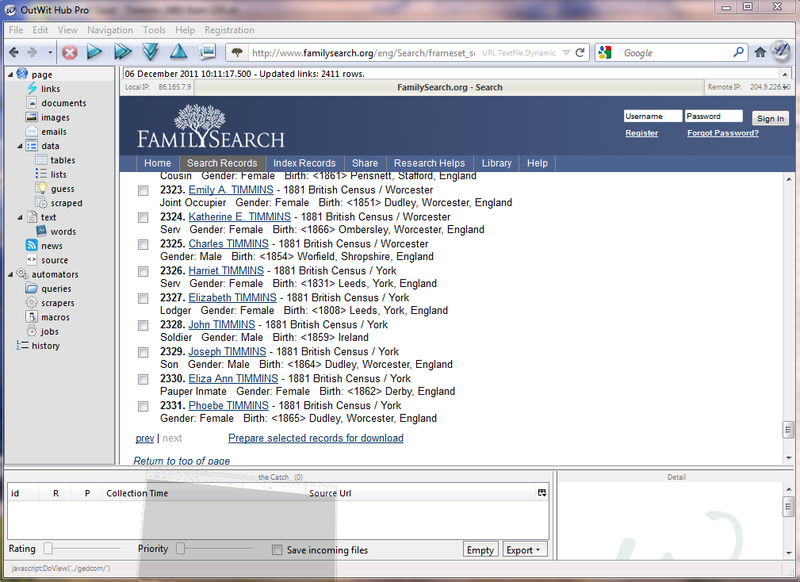 – Commercial genealogy web sites need a form of “fuzzy search” capability on some of the fields. – Does anyone know if it is possible to buy the raw 1881 data set from LDS; one that will load into Excel or Access? – Outwit Hub is great tool for data extraction on the web. – TIMMINS surname origins to continue in the Dudley Parish. Finally – If anyone wants a copy of my Excel spreadsheets, either the original data or the final cleaned and edited version, give my your email address and I will gladly send you a copy.